In 2003, the Los Angeles Dodgers Foundation pledged to create 50 Dreamfields over the span of 15 years for young Angelenos in the communities that needed them most. Monday afternoon, the foundation celebrated the groundbreaking of their 50th Dreamfield at Algin Sutton Recreation Center in South Los Angeles. 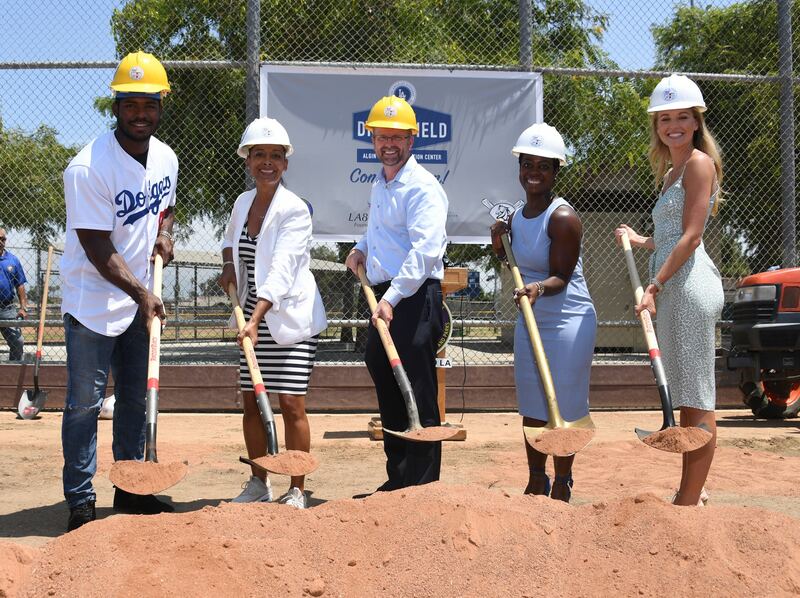 The City of Los Angeles, Tyler Development Corporation, LA84 Foundation and Dodgers star outfielder Yasiel Puig all partnered with LADF to host the groundbreaking ceremony. Puig committed $50,000 and was joined by young athletes from his 66ers baseball team. “Doing these things for the kids make me happy, now I can go to the stadium with a smile,” Puig said. Having Puig, one of the club’s best players, as a major community ambassador is a positive influence for all of the young people LADF aims to help. “To have someone here who is telling them you can be everything you want to be, achieve anything you want to achieve, is really special for them,” Whiteman said. Whiteman and Puig were joined by City of Los Angeles Recreation and Parks General Manager Mike Shull, actor Dondré Whitfield, Tyler Development Corporation representative Calin Nomad, LA84 Foundation President and CEO Renata Simril on the podium for opening remarks. Olympic softball player Natasha Watley, daughter of Algin Sutton Aleta Williams, Dodger Alumni Manny Mota, Dodgers Reviving Baseball in Inner Cities (RBI) and youth baseball and softball players representing the community of Algin Sutton were also honored. Algin Sutton Recreation Center was home to the first Dodgers Dreamfield, back in 2003. The LA84 Foundation has pursued 43 collaborations with the Dodgers, and have been with LADF since the start of the Dreamfield project. “It’s a homecoming for the LA84 Foundation as well to culminate 15 years of work, investment and providing much needed infrastructure and programming for communities such as Algin Sutton with the Dodgers Foundation,” Simril said. More than $10 million has been invested into Dodger Dreamfields. The 50th Dreamfield will be constructed in September, a project costing $300,000. “While watching the Dodgers on the field brings the city so much happiness, it is their off the field work that makes them such a wonderful organization,” Nomad said. LADF is currently working on a plan, with hopes for it to be revealed in September, to share the future of the Dodgers Dreamfield project. “We will continue to ensure that youth in the city of Los Angeles have safe and positive recreational places to play,” Whiteman said.